When I was eleven, I had a "beach cruiser." It was a steel and chrome behemoth of a bicycle. It was two times too big for me and I'm pretty sure it weighed more than my mom's Datsun. But, I road that behemoth five miles every day to a great fishing pond. That bike held two fishing poles, a tackle box, a lunch pail and a boombox.1 The ride up the hill was torture but the ride back home was like a two-wheel limo. That's the best way I can explain the iPhone 6 Plus. Here's my follow up to my initial reaction: The 6 Plus is the absolutely best device I've ever used while being stationary and the worst possible device I've used while moving around. It's a great device for working while sitting but not while moving. My wife desperately wanted my 6 Plus. I gave up the 6 Plus to my wonderful spouse and moved to an iPhone 6. I've had two weeks to test the 6 Plus and my opinions are largely unchanged. But I'll write more words about it anyway because this is the Internet. My pinky finger actually started to hurt because habits are hard to break and I continually tried to hold the Plus like a 5S. The "chin" and "forehead" on the 6 Plus make a lot more sense to me now. 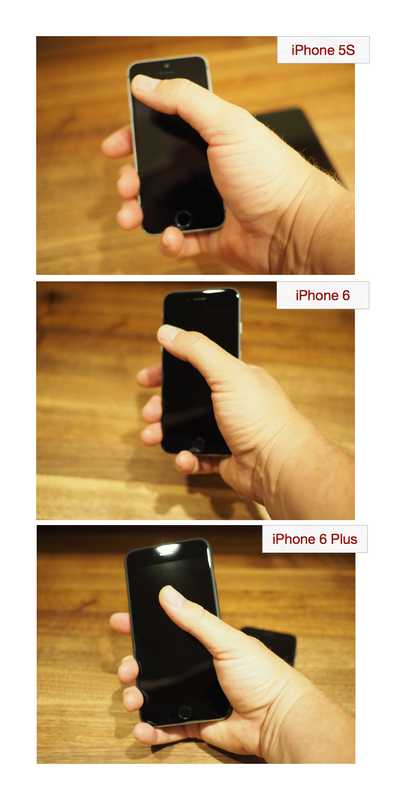 Many times in a day, I’d hold the 6 Plus by pinching the chin with my index finger and thumb. Support for 360 degree rotation means the top and bottom are equivalent. I also held the 6 Plus in landscape about 80% of the time. For two weeks, every time I considered using my iPad, I quickly grabbed my iPhone 6 Plus and was perfectly satisfied with the results. "Oh, this is a really long article. I should grab my iPad. Wow, this looks good on the 6 Plus." "Damn, this is going to be a really long email response. Maybe I should just... oh, landscape email on the 6 Plus is just fine." The 6 Plus is not better than the iPad Air. But it is good enough to not need the iPad for most things. There has been nothing I needed to do that the 6 Plus could not do satisfactorily. Like the phone itself, that's huge. But here's the problem: carrying the 6 Plus is terrible. It's generally uncomfortable. Like wearing pants that are two sizes too big, I can make it work for a day by holding myself awkwardly, but it's not something that I want to do in front of people I respect. The battery life on the 6 Plus might be the best feature of the phone. An appropriate ad might read "The iPhone 6 Plus: A huge battery covered with a screen." Since moving to the iPhone 6 junior, I've become more aware of the dwindling battery in the status bar. It barely makes it a full day while the 6 Plus is ready to kick back and watch an HD movie at full brightness. Ironically, the huge 6 Plus is the perfect travel device. This battery could easily provide enough juice to never really need a backup battery, which is good because any battery case for the 6 Plus would need wheels and at least one handle. The 6 Plus wants to be held in landscape. The split view in Apple apps like Mail and Settings feel so much more natural. It's a compelling option that sets the 6 Plus apart from all other Apple phones. It's an email crunching machine. The enhanced landscape keyboard adds keys for paste, cursor, and text formatting. It's not all that different from the new keyboard for the small iPhone 6 but it's just an added convenience. But the landscape keyboard on the 6 Plus is just more comfortable when it comes to thumb typing with gorilla hands like mine. I'm still surprised at how fast I can type on the 6 Plus. Is this how people with normal sized hands feel on the 5S? Very few apps support landscape on the 6 Plus in a meaningful way. It's not enough to make list rows wider. The 6 plus has enough screen space that I expected apps to work differently. It's early days, but even apps touting iPhone 6 Plus updates didn't do anything more than font scaling. If apps support the new screen space more creatively, it would be very compelling to return to the 6 Plus. Right now only Apple does anything interesting in landscape on this slab of a phone. There was a point in time when pockets were practical. Shirt pockets held pens and reading glasses. Pant pockets held money, wallets and, I guess, beef jerky. But today, they seem to be either decorative or for mobile phones. The 6 Plus certainly fits in my pockets but it's pretty big. Any pocket you can fit your hand or a Pop-Tart in, you could probably put an iPhone 6 Plus in. In two weeks, I never wished for larger pockets. That said, if you look at your pants and think the pockets look cute, you are probably going to have a hard time carrying a 6 Plus for a day. The iPhone bending is a bit hyperbolic. I feel bad for anyone that has put an iPhone 6 Plus or a tuna sandwich in their back pocket and crushed it. That's gotta hurt. There are very few things made out of glass that I need to carry around, but I usually don't put them in a back pocket. I'm funny that way. The 6 Plus survived the unholy tortures of my front pocket just fine. Unlike carrying a 5S around, I was acutely aware that there was a large computer in my pocket, but it never impeded my sedentary life style. The most amusing part of the iPhone 6 is that anyone would consider it large. Perhaps I'm suffering from Stockholm syndrome here, but a couple weeks with the 6 Plus, exclusively, makes all other phones feel like props for an American Girl Doll collection. The 5S feels laughably small. 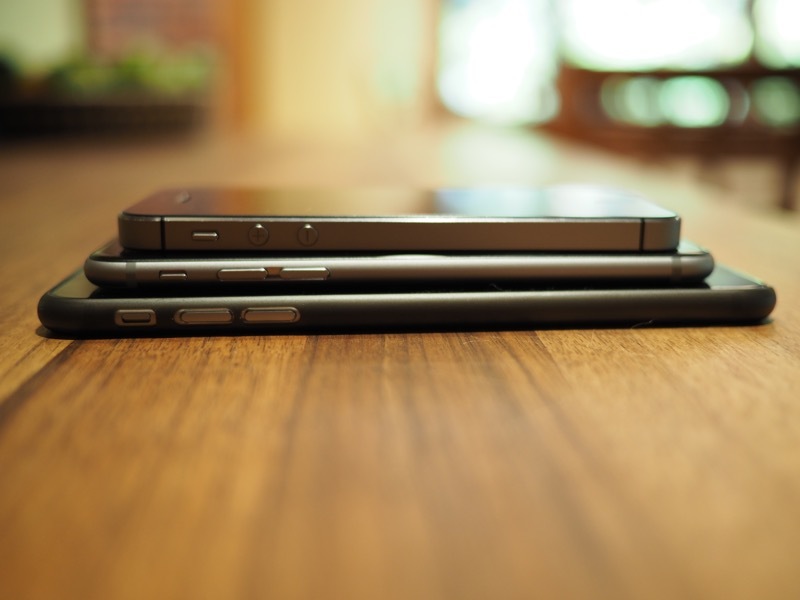 The iPhone 6 feels slightly too small but almost normal. I firmly believe that anyone buying an iPhone 6 should first carry around an old boot as a phone for two weeks. After that, the iPhone 6 will feel like a compact travel accessory. I'm surprised at how often I miss the 6 Plus. I miss it when reading text, working in email, watching videos and browsing the Internet. I definitely miss the 6 Plus around 7 p.m. when I'm getting low battery warnings on the smaller 6. I've been going back to my iPad a lot more often since leaving the 6 Plus. In the end, I think one handed use on the 6 trumps all of the benefits of the Plus (for me). The 6 Plus feels like a pocket computer. The iPhone 6 feels like a really powerful phone. Rather than jam giant photos in between paragraphs, I've bottom loaded them for people interested enough to scroll all the way down.